American traditional or old school tattoos are a style of tattoo that combines black bold outlines, with a limited colour palette of black, red, yellow and green. 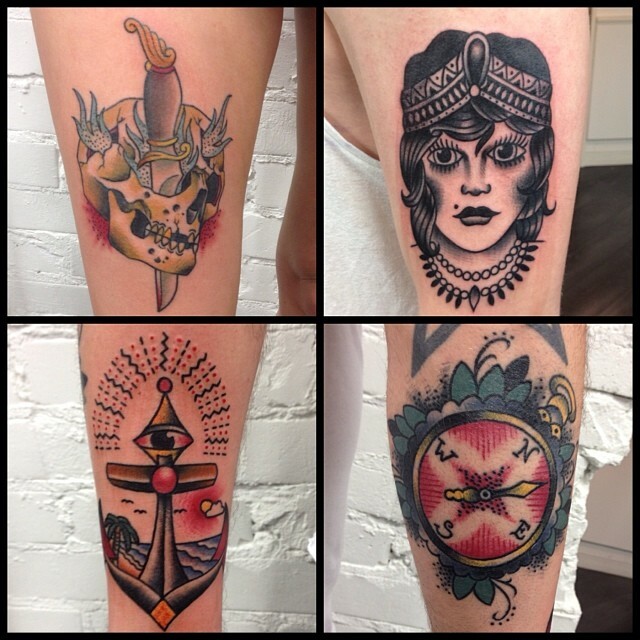 American traditional tattoos are known for their simple designs and are a stylised versions of everyday images. Popular images include roses, eagles, panthers, pinup girls and military symbology. Made popular in the 1920’s to 1960’s, this style of tattoo was primarily for military men and sailors. At every port or military area a tattoo parlour could be found servicing the hundreds of men who were on leave or training. Due to the vast number of people wanting tattoos and the simple tools available at the time, a style was born that enabled tattooist to create bold designs quickly and effectively. American traditional tattoos has seen a resurgence in popularity recently and is now as popular as ever. Even though technology and equipment have improved, tattooists today still pay homage to the traditional tattoo by using a simple colour palette, whip shading, bold lines and simple imagery. Made with love for great people by Latch Web Design.